The School of Theology and Interfaith Studies at EUCLID (Euclid University) offers a primary external (distance or online) degree program specifically called: Master of Arts in Comparative Christian Theology (MCCT). For Roman Catholic students, it is useful to note that the degree is recognized by the Holy See under applicable UNESCO conventions. For Eastern Orthodox students, it is useful to note that a dual-degree option with the St Gregory Nazianzen Orthodox Institute to combine an ecclesiastical degree with a public intergovernmental degree. On the Catholic side, the program’s Principal Faculty is Fr Jose Kuruchavira, a Salesian priest based in Rome (also teaching at the Salesian Pontifical University). In the context of its interfaith / inter-religious mandate, EUCLID offers a online master degree in comparative theology that is primarily focused on Christianity but which also covers fundamentals of comparative religion. Our faculty group has identify ‘must read’ textbooks that are combined with engaging multimedia resources including lectures and debates. EUCLID’s world-class LMS platform delivers the material in a logical progression which is both academic rigorous and achievable for part-time students. Also a Master’s thesis is technically optional, EUCLID recommends that all students consider producing a thesis on an area of interest in comparative theology. EUCLID congratulates Fr Jose Kuruvachira on the occasion of his recent meeting with Pope Francis held at the Vatican on January 9th 2014. 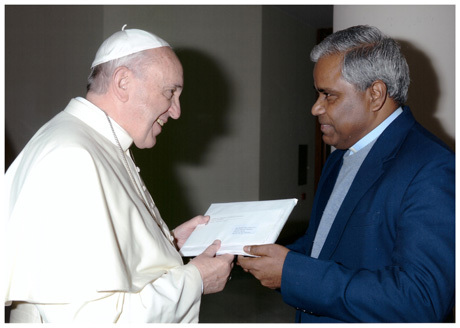 The Pope had invited our distinguished EUCLID faculty member to mark Fr Jose Kuruvachira’s ordination jubilee and personally received a letter about EUCLID’s important work in ecumenical and inter-religious dialogue (Rome; January 2014). This advanced program in Comparative Theology provides an outstanding academic preparation to its students for further studies at the doctoral level as well as service in churches and institutions of higher learning. Its main purpose is to offer an engaging and academically sound graduate program to anyone interested in comparative theology (focus on Christian theology). EUCLID’s Master’s of Theology programs are supported by a world-class faculty group which is truly global in scope and dedicated to high-quality interaction with each student. For each program, 3 faculty members are featured below, and the full faculty roster is accessible via the top menu. The full MCCT Brochure can be downloaded in PDF format. EUCLID is the only intergovernmental, treaty-based university with a UN registered charter and recognized expertise in diplomacy. Join the alma mater of ambassadors and senior officials globally.